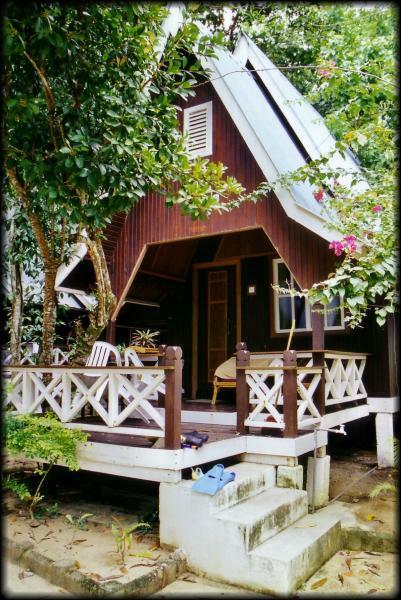 This was our chalet in the Perhentian Islands. 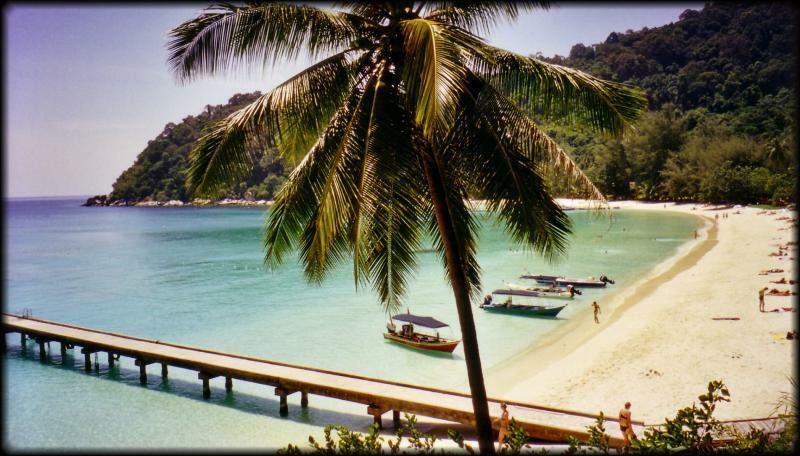 We stayed at the Coral View Island Resort in Pular Perhentian. It wasn't really a resort, but it was nice enough. Our bad luck continued at our hotel. The Coral View Resort seemed to have a somewhat reasonable price, but the non-fan rooms only offered single beds that couldn’t be pushed together. They are also high up on the hill and require climbing over rickety stairs to get to. We upgraded to the A/C room to get a full bed. Wendy went to use the toilet, and as it was draining, the wastewater spouted all over the floor. Ok – time for a new room. Again. I go down to the main desk, where I am told that is the last room in that class, and I’d have to spend an extra US $10 a night to get the next step up (1 minute walk from beach). They told me the toilet would be fixed within an hour – no thanks – and they wouldn’t give me a free upgrade to the next room. After discussing with the manager we finally agreed on a price in the middle. The Coral View's beach was nothing to speak of, but just round the corner (with a series of questionably maintained boardwalks leading to it) was the Perhentian Island Resort where we spent most of our time swimming. This was more like it! The hotel’s beach we’d landed on was full of coral and not very pleasant to walk on or swim from. 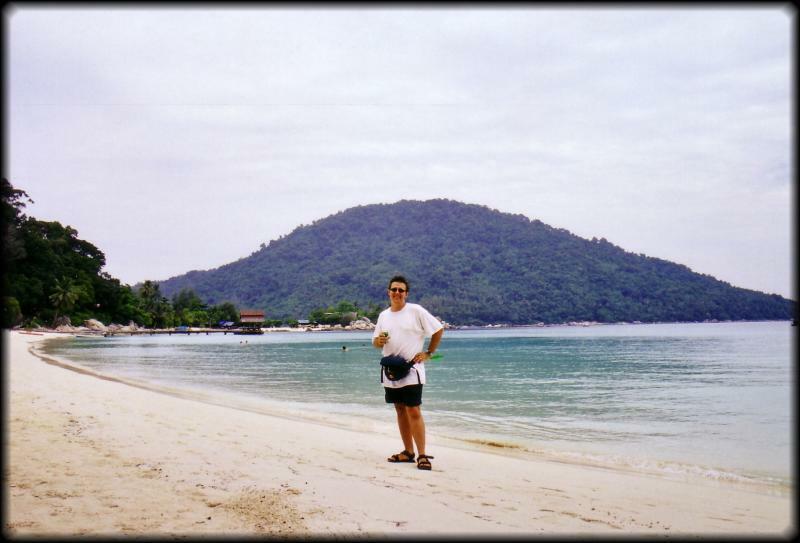 Fortunately, our guidebook told us that the most beautiful beach on the island was next door at the Perhentian Island resort. There is a series of steps/walkways over the headland to get there, and it’s worth the walk. The beach is beautiful, the water is turquoise, crystal clear with nice soft sand. We spent the rest of the day sleeping, swimming, and checking out all the fish that swam around the coral on the headland. We found a lodge serving pizza, and sat down on tables on the beach again. Earlier, we’d noticed there was a bit of wind off the shore, but the sky had been clear as the sun was setting so it didn’t concern us. But suddenly, as we waited for our meal, the wind whipped up, and the wait staff all came rushing out of the main restaurant area, yelling at everyone to get inside, bring their drinks, and table numbers! There was a bit of mad panic as everyone crowded inside the small roofed building, which suddenly was given solid walls as they rolled down the metal shutters. Seconds later the storm hit, an almost horizontal blast of rain and wind coming from almost all directions at once. Through the cracks of thunder, we could hear tree branches falling around the restaurant. We decided that this storm wasn’t just a passing thing, and asked for our pizza to go. Within seconds of stepping out from the shelter, we were soaked to the skin. Fortunately, our little maglite was easily up to the task of getting us home, as we jumped over fallen branches, waded through flooded paths and made our way along the beach, knowing that we were only a few hotels down. Amazingly and fortunately, the lights never actually went out, so once we found our resort we could follow the path lighting back to our cabin. What was a 5 minute walk out to the restaurant turned into a 30 minute ordeal home, taking shelter under whatever buildings we could find during the harder downpours. It was scary. Glad to be back in our room, we sat down and ate the pizza, slightly soggy and a little bit sandy…. Then, an hour later, food poisoning hit Ian. He spent the rest of the following day in bed, trying to sleep in between the sound of the chainsaws and yells of the workers as the island cleanup began. Fortunately we’d brought some antibiotics from home, and the following day he felt well enough to try some snorkeling. The little bit that we did do was spectacular. We heard that there were sharks (not scary) and turtles to be seen just off the headland, but he wasn’t feeling well enough to try it. Crowds of smiling, laughing Japanese tourists were being ferried back and forth all day from the resort’s beach to see them. Trying to enjoy the beach. By the next morning, Ian was fine, but uh-oh, now Wendy was not feeling too good. We had to get off this island and get to Kuala Lumpur. The fast boat ride was slightly better then the way over (thanks to a heavyset guy who sat at the very front of the boat, preventing it from planing over every wave!). We got a taxi direct to Kota Bharu (We tried to haggle unsuccessfully, and backed down when we saw he was the only taxi left. Unfortunately what we didn’t realize is that a 2 minute walk into town would have taken us to about a dozen more cabs sitting around). The airport in Kota Bharu was very nice, modern, and air conditioned. When the ticket counter opened, we found that the next flight to Kuala Lumpur was full, but we were lucky enough to get standby seats.